Many chorus effect units have poor high frequency response. But the SCH-1 uses BBD technology to accomplish a truly superior, low noise chorus effect by boosting high frequencies when needed. 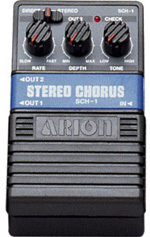 Looking to buy the Arion Stereo Chorus SCH-1? Check for availability. I, too, was given this by a guitar player, because he couldn't do a simple soldering job on the 9v wire. But even with the battery cover and all three knobs missing, it turned out to be a decent pedal for the price (ha ha!). Along with the standard 3 controls, it also has a switch to go between STEREO and DIRECT, which provides some nice tonal possibilities. That, coupled with two OUTS, provides a decent pedal overall. a guy i work with gave me one of these because he got rid of his guitar and has no use for it. when he told me about it, he said it was a boss, so i was a bit disapointed when i saw it was just an arion, but i've been using it a lot lately. it sounds great as the start of a feedback loop. it's got a kind of cheesy death ray noise if you don't distort it, but i run it through a buzz box and it sounds a lot better. this is my first chorus, so i have nothing to compare it to, but i like it a lot. Bad Points: i couldn't really find much use for it anywhere other than a feedback loop. it kind of gets lost in the mix if your chain's too big. a really lush chorus. gives incredible sound for high frequencies as well as low ones. good in a feedback loop.